Most industries need to look back to a by-gone period to capture their ‘golden age.’ Fortunately for whisky drinkers, the golden age of malt is now. While it’s true that many great (and small) distilleries have closed their doors forever, lovers of whisky around the world, however you wish to spell it, have never had it so good. 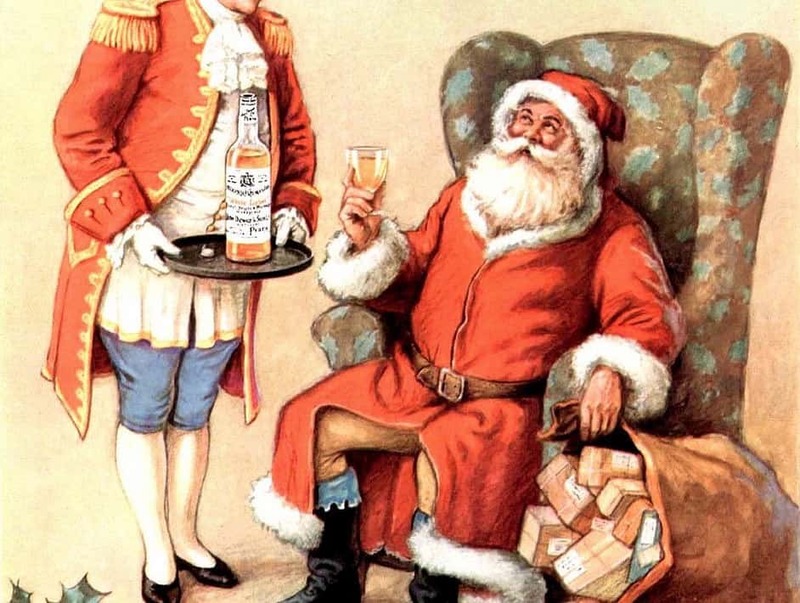 It may be harder to find those lost bottlers and independent manufactures of yore, many of them replaced by the drinks giants of today, but globally we dwell in the midst of an effloresce of great spirits. From Japan, America, and even India, some fantastic whiskies – both single and blended – are being made available. But what of whisky’s British roots? 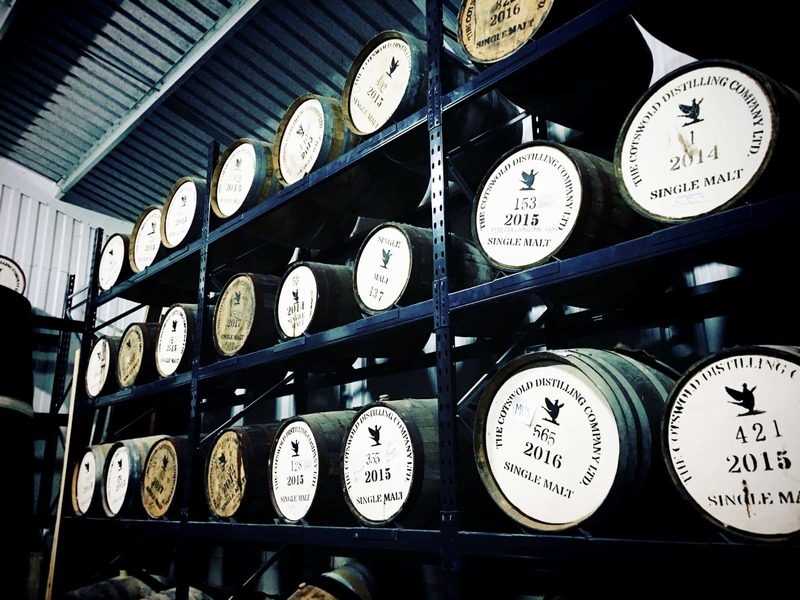 Has it been a golden tide to raise all casks, as it were? For certainly, Scottish whisky has been the principle expression of malt that nearly all others have aspired to reproduce and imitate around the world. And while not exclusively a product of Scotland, our possibly soon-to-be independent-again neighbor to the north has been the most recognizable face of that most divine descendent of the ancient art of distillation and the European monk’s quest for aqua vitae, for most of our modern era. Even bootleggers in the States durning Prohibition weren’t above slapping on fake labels proclaiming their hootch, possibly the real thing, but just as likely the frightening product of illegal domestic moonshiners – as genuine ‘Scotch Whisky.’ A small lake of the stuff lies on the bottoms of lakes and rivers to this day, innocent causalities in the clandestine rumrunning war waged between Al Capone and Elliot Ness. More than eighty years later, a single malt Scotch remains the hallmark of a fine drinks cabinet. But as Malt’s editor and resident champion of Japanese whisky will tell us, it’s no longer the first and last word when it comes to great malt. However, for those fans of the stuff who are not yet as globally adventurous as Mark, or for that matter are neither collectors or connoisseurs in general, what is the state of UK whisky today? – which while now still predominately means, Scottish whisky, has seen new whiskies coming from Wales and England. Spoilt for choice, is the answer. Even if your budget and access to the world’s finest whiskies are limited, there are some very interesting examples out there. And drinking ‘domestic’ doesn’t mean you still can’t have a little fun. Aside from the venerable output of our Celtic cousins across the Irish Sea, even the Welsh, Iechyd Da!, have gotten into the action. And after nearly a century of non-production we have new English whiskies rolling the barrels out their cellar doors again. 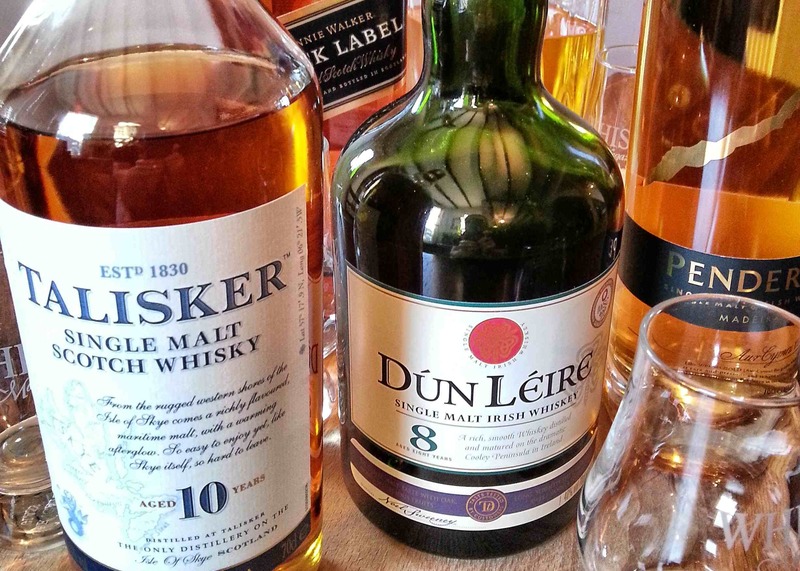 So with that in mind, let’s pour ourselves some British whiskies, and one Irish, that are readily available and won’t take a collector’s checkbook, and see if they are truly the products of a golden period or just coasting along in its wake. Our first whisky or whiskey, comes via Sainsburys, from the Cooley Distillery – contentiously from our point of view, situated just south of Northern Ireland on the Cooley Peninsula in County Louth. A distillery which until recently was the last independent Irish distiller – now owned by Beam Inc, Cooley is known for making some interesting whiskies. Obvious, this isn’t technically a British whisky – but without opening up arguments over Bushmills and Midleton, north vs south, it’s somewhat unique for an Irish one. Unlike most Irish triple distilled whiskies those from Cooley are double distilled like their Gaelic cousins to the north in Scotland. It’s been matured in both Irish whiskey and bourbon barrels, with their lashings of vanilla scented American oak. Taste the Difference Dún Léire 8 Year Old also has the distinction of having been named both Jim Murray’s – of the eponymous Whisky Bible fame – Irish Single Malt of the Year and the IWSC’s Gold Best in Class. So it seemed fitting to add it to our golden age of British whiskies tasting – even if it is both technically Irish and rather a young thing. Colour: lined up with three other drams, this is the lightest of the lot, very pale, a straw yellow in the glass. On the nose: sweet and estery, giving up notes that are extremely floral, fruity, and downright minty, very fresh but with a finish soaked in barley sugar. A really intriguing – and to be honest, a more captivating nose than I was expecting from an Irish whiskey. On repeated nosings I’m getting lurking honeysuckle, orange and hawthorn flowers, white grapes, some solventy aromas – in a good way – and that fresh, grassy just-mown smell. Really very nice overall and indeed, different than most Irish whiskies I’ve come across. In the mouth: the sweet flavours you’d expect are there, with bananas, gently stewed fruits – pears and apples I’d hazard rather than citrus – marzipan, bitter peel, and a peppery bite. A sugary mouth-feel coats the tongue but that sweetness is kept in check or at least in balance by the zesty, spicy finish. In a single word, fresh! This is a young spirit but one that avoids both harshness and over-simplicity. I can really see this working when sipped in the late morning or early afternoon on a cool spring day – or just as likely here in the UK, a typically damp summer one. Not hugely complex but there is more here than I expected. And at twenty pounds for a bottle, this is excellent value and something different from your everyday Irish triple distilled whiskey. Nestled in the Brecon Beacons, Penderyn is not only unique for being the only Welsh whisky distillery, but for its single barrel production method where the wysgi is made one barrel a day in its custom designed copper pot “Faraday” still. Next placed in bourbon barrels from Buffalo Trace Bourbon in Kentucky, our drop here then is transfered to Portuguese barriques which formally held Madeira wine. 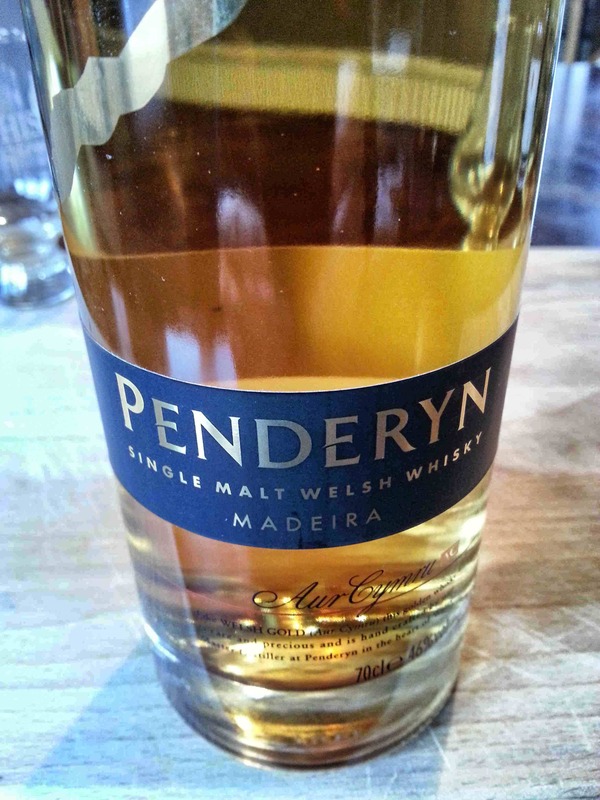 It’s a young spirit, averaging no more than four to five years, but Penderyn claims that its unique distillation process and micro-environment encourages earlier maturation. Is it Aur Cymru (Welsh Gold)? Let’s put it to the test then, and pour our second measure. Colour: quite pale in the glass but with a touch more gold here, still light but compared to the first dram in our tasting this has a touch of amber lurking in the depths. On the nose: woody, spicy, gingerbread notes and some nicely toasted nuttiness at the back but with noticeable alcohol here as well – very estery but totally different from the Dún Léire. There are some winey, almost eau de vie aromas in the background, coming across as punchy and fruity as the liquid warms up but in that distinctive distilled, dialed-down manner. I’d say peardrops but it’s more subtle than that – more Madeira here, truly, and not unexpectedly so. You really notice the wood on the nose, but not the typical vanilla or sweet bourbon scented sort – more like buttery wet oak soaked in a potent spirit, which is after all I suppose, what cask finished whisky is at heart. In the mouth: You can really taste the Madeira finish here as well, lashings of dry heat and vinous oak intermingling with that buttery flavour and a faint touch of raisiny richness. It’s a little thinner, and shorter on the finish than I’d ideally like. But there is no questioning the distiller’s intent here to provide both a pleasurable drink, and one with its own unique style. I think the Penderyn succeeds for the most part but it treads a thin line between joining up these elements and masking the harshness of a young base spirit with the flavours of the wood. Out of all of today’s whiskies, this was the most pricy at around 30 pounds. Was it worth it, beyond the novelty aspect of drinking a Welsh whisky? I think so. A second pass on the glass rewards the patient. The good news is it may be good now but I suspect it will reward further airing and a little more time to develop in the bottle if you can be that abstemious. Our third single malt is Scottish, an island malt to be exact, from Skye. 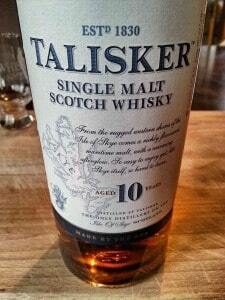 And despite Talisker not being an Islay malt, it is a peated one. I’ll have to admit a slight bias here: I have predilection for smoky, massively peaty malts, in the great Islay style, perhaps more of a mania. 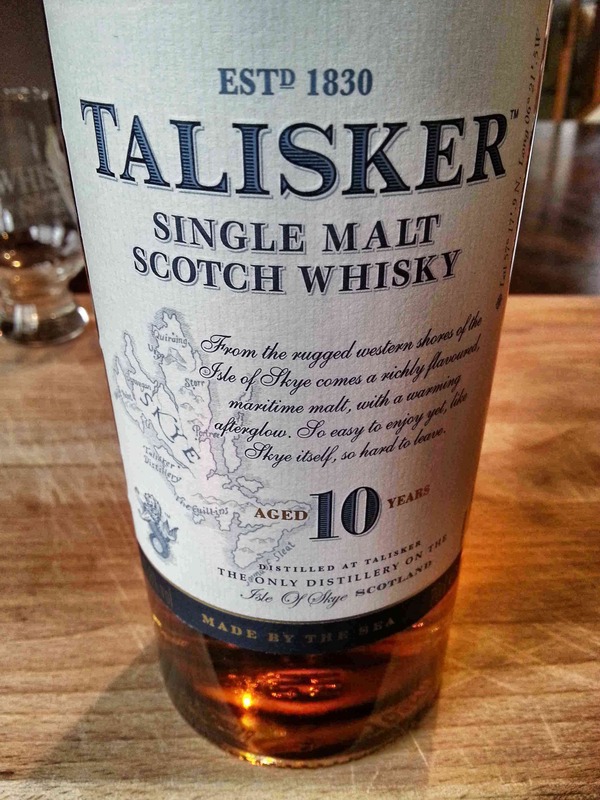 And I must confess to a curious ignorance about Talisker which I’ve had a number of times previously but I’ve generally ignored in favour of its more dramatic neighbors. 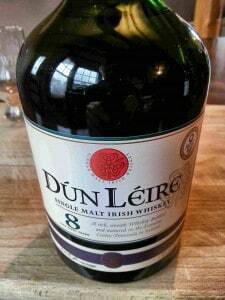 And yet, it is regularly listed as one of the top “classic malts” of Scotland and suffers a little perhaps from its omnipresence on both supermarket shelves and in your more up-market London boozer. Colour: a rich amber gold hiding orange hints, viscous and deeply coloured in the glass. On the nose: an immediate and satisfying hit of iodine and peat, smoked fish, but faint stuff compared to its often more heavily peated neighbors on Islay, though buoyed upwards by a promise of barley and malt sweetness. All of this however, in incredible balance making for subtle aromas that I could enjoy nosing for hours – had I the restraint necessary. In the mouth: here as well it is smoke and peat and salty kippers which blend with the sweet almost syrupy character of the underlying malt to give an overall rich, spicy, and satisfying dram. White pepper and warm, slightly sour notes, let the finish go on far longer than you’d expect given the relative mildness of the nose. With a few drops of water this blooms even further. Balance – coupled with a complexity that while understated, is very much present – is the key word here. Everything in harmony, mellow, fruitful, warming and an absolute cracker to drink outdoors with its distinctive maritime character. This I suspect, is a real sessions malt that you could open or re-open beside a nice warming fire and enjoy long into the night, a lighthouse being optional. An overlooked classic, I have to admit, and one I’ll not pass by so blithely again in the future. So that’s our first two “British” single malts and one very interesting Irish whiskey thrown in to round out the Celtic tiger side of our tasting. However, I wanted a fourth whisky in the first flight – call it our control if you will, and one that would put them all hopefully in perspective. With this in mind I chose Johnnie Walker’s 12 year old blended offering, famous for being the classic sampling of 40 different malts from across Scotland’s distinctive regions: a mini-census of the country in a bottle plus the mellowing influence of grain whisky and skillful blending to boot! It has the recognition factor, too. It’s hard to think of a better ambassador for the gold standard of whisky not just at home but globally: its iconic high-stepping image showing up as far afield as a cat murdering psychopomp in Haruki Murakami’s novel, Kafka On The Shore. Right, so what is it when it’s at home? Colour: the darkest of the lot, rich caramel lying over shades of amber-red gold, decadent looking even before the first sip passes the lips – which is no doubt the point here, even if is the controversial product of E150a being added; it’s a drink whose visual appearance is as tailored to the brand’s luxury image as the blend of actual whiskies in the glass. On the nose: this is all about rich seductive aromas. Mild citrus and spice, orange peel – thick cut of course – syrupy barley and brown sugar, woven together and wafted forward by gentle briny smoke – perhaps the notable thumbprint of Talisker in the blend? All of it makes you want to sit down in an overstuffed club chair and tip back the glass with a good book at your elbow. In the mouth: mouth coating, sweet, smokey, dried tea leaves and tobacco, rich and long. This is almost too sweet for my liking but the blend has enough going on here – and enough of that salty, peaty, complexity layered over it and finished by a peppery kick – to keep it from descending into Candyland territory. Almost minty on the aftertaste which is fresh and clean for all that richness upfront. While it’s not as interesting as its more complex sibling Green Label, considering its price this is a really rewarding blended whisky. 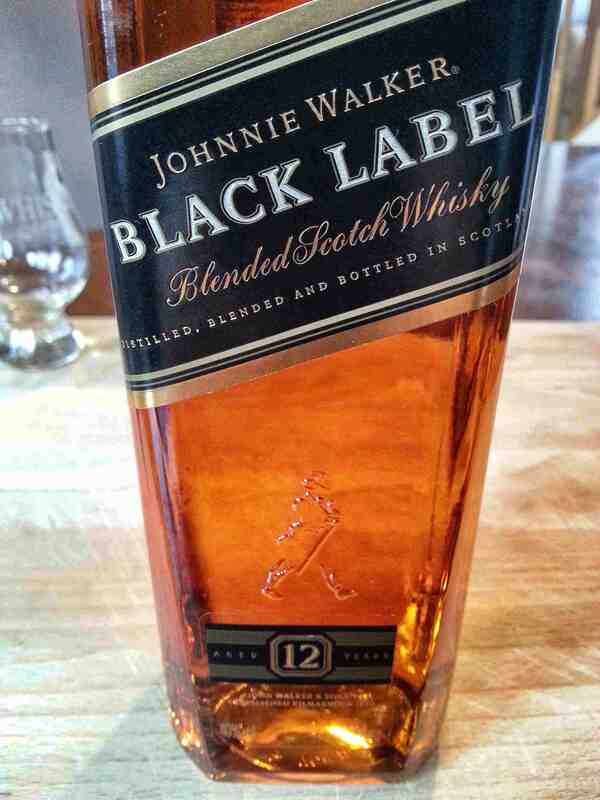 Like young whiskies, blended offerings can be overlooked, but when done right, as the classic status of Black Label shows, it can offer an almost unmatched drinking experience when it comes to pure pleasure. So, four very different whiskies all aspiring to reach that unmistakable gold standard, at least in the glass. I think they mostly succeed. And while it can be easy to discard the efforts of major distillers and focus on more bijou producers, to do so to the point of exclusion of more humble drams is a mistake, as they’re still producing – overall, and all over the British Isles and Ireland, a great deal of very good and very drinkable whisky that has more than earned its place here in the UK and abroad. Next Time: the exploration of British whisky continues with Part II: St. George & The Dragon. I’ll round up my review with a look at some English whiskies which are putting the cork back in after nearly a century’s hiatus, plus a dragon from the East which is sure to delight Mark! has spent over a decade working in the UK wine and spirits trade, as a writer, retailer, buyer, educator, and consultant. How is a Irish whiskey classed as British?